Walter de Lacy survived both Hugh and William Gorm his younger brothers so, on Walters death in 1241 marked the end of the Baronial descendants of Walter de Lacy the First Lord of Weobley. The English descendants of Walter brother, Ilbert de Lacy The first Lord of Pontefract fared little better in 1311 Henry de Lacy Earl of Lincoln died leaving no heir. The de Lacy family had entered their ‘Grey Years’. With little or no recorded history to add to the de Lacy Chronicle. Happily this was far from being the end of the family tree indeed you may consider it was the start of today’s Worldwide Lacy Family tree! So from where did the remaining de Lacy's descendants come from? When brother’s Ilbert and Walter first came to England to support William the Conqueror they brought with them many first and second cousins also carrying the de Lacy name. Many prospered and grew within the Lordships of Pontefract and Weobley and later Meath in Ireland. Hugh de Lacy, Lord of Meath had the power to settle estates on Knights and others close to him. His new powers had enabled Hugh to create Baronetcies without recourse to the King. At least three of the new Barons created were named de Lacy. Even from the Baronial family de Lacy, there is the probability of succession in later years. Hugh and Rohese had nine children, four sons, and five daughters: Walter and Hugh (II) then a third son Gilbert de Lacy for whom there are no remaining records of his life. What happened to Gilbert? Did he leave any children? ​There is speculation that William Gorm and Gwenllian de Lacy had, at least, two sons, Thomas de Lacy and Henry de Lacy, who lived on beyond their death. In future years, there are many Irish claims of descendants from William Gorm de Lacy. Here we show fragments picked out of history. 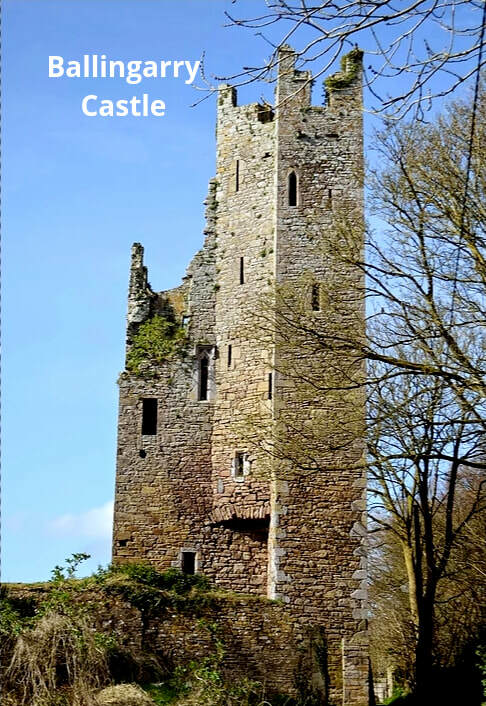 The history of Ballingarry Castle is later than the period covered on the ‘ de Lacy Irish Castles’ pages, a better following of the history of the Irish de Lacy family and the castle forms an important part of ‘The Grey years’ page. An original Motte & Bailey castle, with de Lacy records back to early 14th century. Possibly improved as a stone walled castle by one of the three de Lacy Barons created by Hugh de Lacy Lord of Meath. The castle continues to be referred to as ‘the de Lacy Castle’. Main Street, Ballingarry, Co. Limerick, Ireland. The village of Ballingarry grew up around the castle and the castle is now part of Knight Street.The de Lacy family retained its connection throughout a turbulent period in Irish History right up to the Flight of the Geese in 1691. Ballingarry Castle was a Geraldine stronghold, held by the prominent De Lacy family. In 1569, 40 men were slaughtered at the castle, when it was captured for Queen Elizabeth I. ​Ballingarry, and the castle in particular, required substantial rebuilding in the 15th century having been destroyed in earlier times by ‘Irish foes and English soldiers’. In 1613 William Lacy was granted a licence to hold a market every Tuesday and an annual fair in Ballingarry. Plaque commemorating the 1450 area surrounding Dublin still under the control of English. The de Lacy families lived beyond the pale. The de Lacy family members mostly (but not all) lived within the Earldom of Desmond. They could be regarded as ‘living beyond the pale’ a hundred years earlier than the English recognition of the pale in 1450. Their alliagence was now given to Lord Desmond, John FitzThomas FitzGerald. Over time, according to English sources, the FitzGerald family became highly assimilated to the local Irish culture. The final Earl of Desmond was Gerald FitzGerald, the 15th Earl. The FitzGeralds had resisted the English Reformation leading to their forces being recognised as ‘The Geraldines’. Throughout all this time the de Lacy family fought to support each generation of the Earls of Desmond against the English forces. For which they received many awards and honours. There are scattered references to various members of the Irish de Lacy family before the 'Flight of the Wild Geese' so I hope to add more at a later date. While little to show, the extended de Lacy continued to grow! Can you offer any creditable history to the 'Grey years' Irish History?